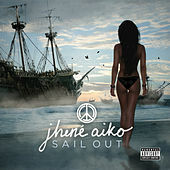 Jhene Aiko has a diffusive kind of songwriting reminiscent of The Weeknd. On "The Worst," she sings the chorus, "Don't take this personal/ 'Cause you're the worst for what you've done to me," then offers a second, more prominent bridge: "I don't need you/ But I want you." Guest rappers like Childish Gambino and Ab-Soul generally fit well within her orbit -- and who doesn't want to hear a new Kendrick Lamar verse? But they draw attention away from what should be her moment, even if it's just a too-short EP that hopefully leads to something greater.